The story of The Grinch may be set around Christmastime, but its heartwarming message can be relevant for all seasons…especially when you think about how his heart grows three sizes larger. (Valentine’s Day, anyone?) 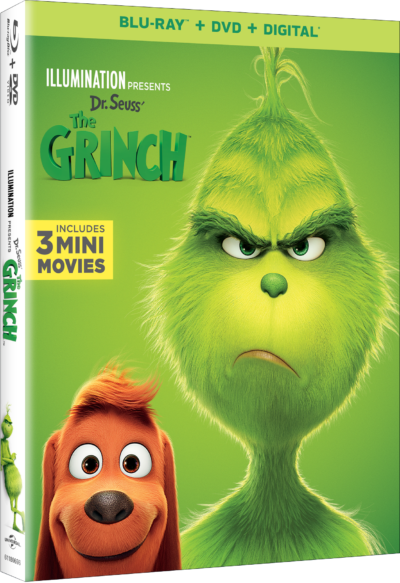 Now you can own Dr. Seuss’ The Grinch on Blu-ray and DVD as it will be released February 5th! 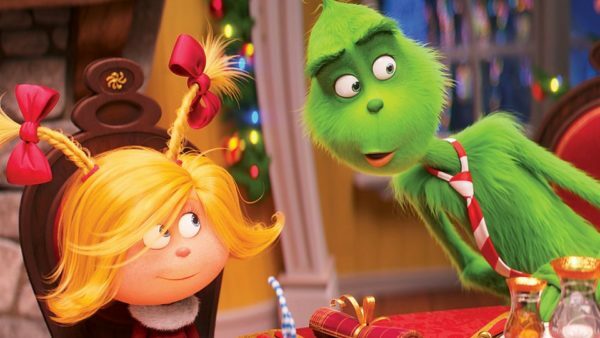 I’m sure you already know the story of The Grinch, but if you don’t, the film is based on Dr. Seuss’ beloved tale about a cynical grouch who goes on a mission to steal Christmas from others, only to feel his own heart grow three sizes larger through unexpected friendships. Narrated by Pharrell Williams, Dr. Seuss’ The Grinch stars Benedict Cumberbatch as the infamous Grinch, who lives a solitary life inside a cave on Mt. Crumpit with only his loyal dog, Max, for company. The incredible voice cast includes Rashida Jones as Donna Who, Kenan Thompson as Bricklebaum, Cameron Seely as Cindy-Lou Who, and featuring legendary actress Angela Lansbury as the mayor of Whoville. 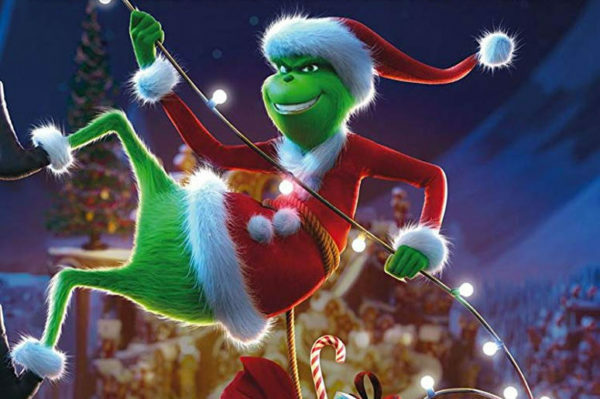 Funny, heartwarming and visually stunning, Dr. Seuss’ The Grinch is a perfect night in for the whole family! 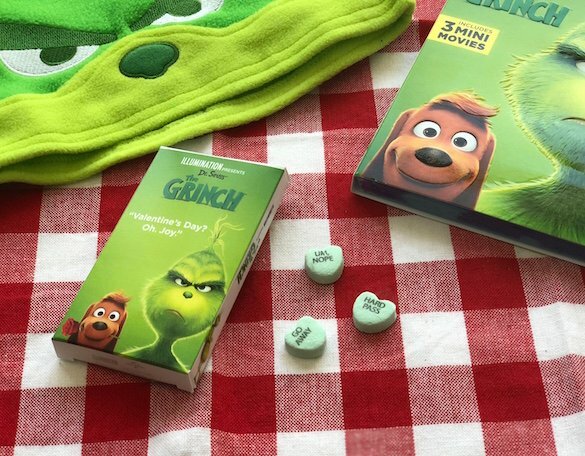 Before your get ready for your The Grinch family movie night, how about some Grinch Valentine crafts? Click HERE to download cute The Grinch Valentine envelopes and a Grinch Valentine’s Day Garland craft! “Yellow is the New Black” Mini Movie: Before they all make their big escape from prison in Despicable Me 3, a couple of lucky Minions get a taste of freedom as they break free with the help of one of their fellow human inmates. “Dog Days of Winter” Mini Movie: Max braves the harsh winter weather and an uncooperative Who to bring a sick Grinch his favorite hot tea. “Santa’s Little Helpers” Mini Movie: Fan favorites – the Minions – are back for another adventure! Having been accidentally dropped off at the North Pole, our Minion pals make the most of the situation by trying to become elves. 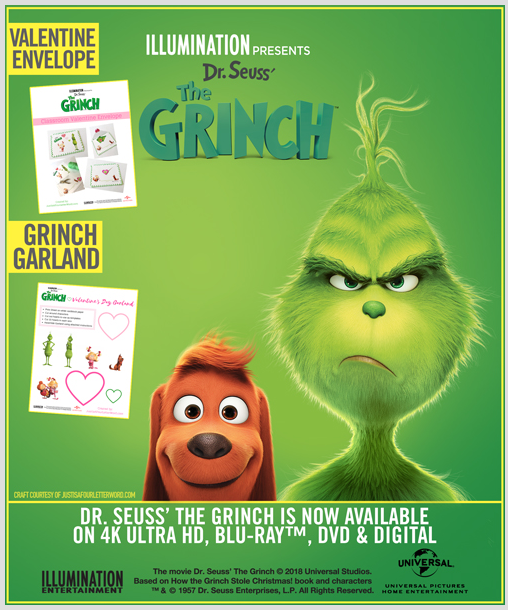 Enter to win a Dr. Seuss’ The Grinch prize pack to enjoy with your family! 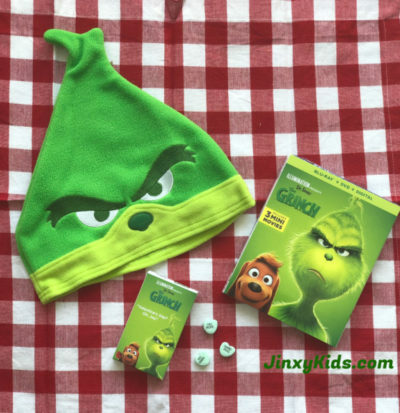 Reader Giveaway: One lucky Jinxy Kids reader will win a Dr. Seuss’ The Grinch prize pack which includes the Blu-ray version of the movie as well as some fun goodies. To enter, just complete the entry form below by 11:59 pm ET on 2/18/19. Good luck! My whole family, especially the kids! my whole family will love seeing this. My family. We all love the Grinch! My sister will enjoy this with me, she loves this movie too! I would enjoy watching this with my little angel. Paisley and I would love this movie so much! My nephews would love this prize pack! Everyone’s a fan of the Grinch. My sons would enjoy this movie with me at home. This would be wonderful to watch with the family. Thank you for the chance. We love the original. Watching the Grinch is a Holiday tradition in my house. I’m looking forward to seeing the new version. I’d watch this with my grandkids. My kids and I will be enjoying this prize pack. The hat is adorable! “Let us know who will be enjoying this prize pack with you if you win.” Everyone here will enjoy this! I’d be sharing this prize pack with my Valentine’s of course, my hubby. We love the work of the creators of this film, and we really enjoy the voice-over acting of Benedict Cumberbatch. Plus, I’ve always identified myself with The Grinch, so I really appreciate the opportunity to win. So now, it’s up to the grouchy old holiday fairies to send me so green fuzz my way for good luck, lol. Love that little guyl Thanks for the sweep. I’ll be sharing it with my 12 yoa granddaughter, Rahjae. Thanks. My boys will be enjoying this with me. I will be enjoying this prize pack with my grandsons! My foster kiddos will love this prize pack! My kiddo would love this!! The hat is adorable. I will be enjoying this with my nieces! My twins will love this!! I will be enjoying these wonderful items with my grandson and granddaughter; if we win that is. I’d enjoy this movie with all of my grandkids! I would enjoy this with my husband and my daughters! I would enjoy this movie with my niece if I win. She really enjoys the Dr. Seuss movies. I would enjoy this wonderful movie with my niece and her little boy. We all love Dr. Seuss. I would be enjoying this with my son and daughter! I love the Grinch. It is my favorite movie for the holidays. I would love watching this with my kids. I will be sharing this with my little grandson Aiden. My grandchildren will enjoy this with me. I will share this with my daughter. My kids will be enjoying this with me if I win. My kids would be enjoying it. All 3 of our children would enjoy. My daughter would like this prize pack. I will be sharing this with my 2 year old daughter and my nieces. I’ll be enjoying it with my grandchildren. My daughters would enjoy it. “Who” won’t enjoy this movie (good pun – lol). We will all enjoy the countless time we will watch this movie with the grandchildren. It will be lots of fun! My grandson and I will be enjoying this prize pack if I win. This would be for my family if I won. It looks like such a cute movie! I will be enjoying it with my niece and nephews. Thank you for the chance to win! Me. lol! Really though, I want to see this movie. And I really like candy hearts so I think I’m more excited about it. I will be watching this with my little man!! If I won this my son would most def enjoy it. He loves the Grinch. I would love to share this one with all the kids in the family they would love it. My nephew and I would both love this prize! My kids would love this! It does look like a cute movie to watch with them. My son will enjoy it with me. MY 5 YEAR OLD AND I REALLY WANT TO SEE THIS!!! My kiddos and I will be enjoying this movie together at our weekly family movie night! I want this for all of my granddaughters to watch. I want this for all of my granddaughters. i would have it about 12 seconds, before it mysteriously become my grandsons. Our whole family will enjoy this prize, but especially my youngest nephew. Thank you for the chance to win. My nephew would love this prize pack. My sons will love this! I would enjoy the movie with my sister. My whole family would enjoy this dvd with me. I think we’d all love to see it. My daughter has been looking forward to seeing this movie! My whole family will be enjoying this prize with me if I win. We would all love to watch the Grinch movie together. haven’t seen the grinch for years. I’d watch with my 5yo daughter. We saw it in the theatre on Christmas. My boy would love this movie. Thanks for the chance. i’ll watch it with my wife and daughter! My 2 and 4 year old daughters! The whole family will enjoy this…even the cat! We all went to see it in the theater & I’d love to have it for our movie library! It is my favorite version yet! My family would enjoy the Grinch! I would share this movie with my son. Me! I have been wanting to see this movie! I love the Grinch ! My daughter and I both love the Grinch. We watch it every year. This would be for my 3 daughters, they want to see it. My girls will enjoy these with me. My son would love this if I won. My 4 grandsons will be enjoying the movie with me. My son would definitely enjoy this with me! I will be enjoying this movie! haha Thanks for the chance! … and the soundtrack is amazing! I would share this with my Little! My grandkids… for sure…actually, I am looking forward to seeing to too! My grandsons would really enjoy it! I would love to enjoy this with my nieces and nephew. We would all enjoy watching this movie together. 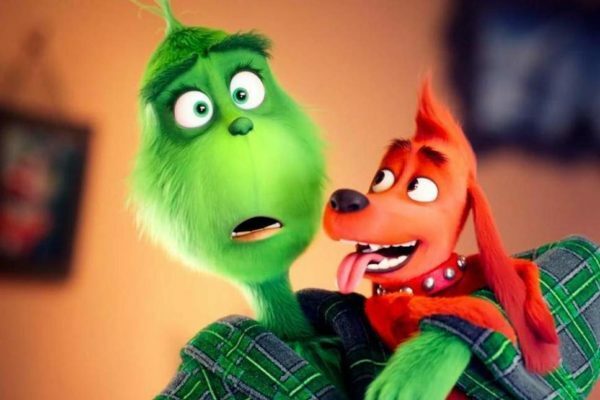 The whole family would enjoy The Grinch, my son went and saw it at the movies. This will go to our Samantha. She loves that hat! My grandchildren and I will enjoy watching the grinch together. Thanks! My daughter will be enjoying this movie with me. We love the Grinch! It would be for me and my daughter!! We haven’t seen this movie yet and Christmas can be year round at my house! My grandchild will be enjoying this prize pack with me if I win. Our whole family would enjoy it together. We would enjoy it with our granddaughter. My littles would love this movie! I will be enjoying this prize pack with my 2 daughters if I win!